Ernest Hemingway is not the only person to find beauty and relaxation in Petoskey. This 6,000 person community nestled on the shores of Lake Michigan's Little Traverse Bay is a destination for visitors because it has so much to offer. Ernest Hemingway loved his visits to the Petoskey area and you will, too. Charm? You bet! 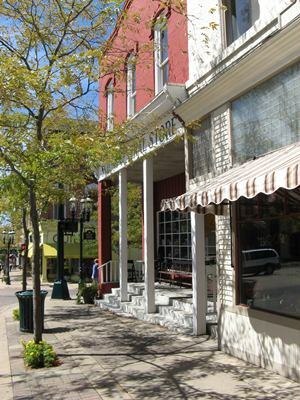 Petoskey's Gaslight District is the place to shop, walk, dine, and enjoy. Walk through the pedestrian tunnel to the beautiful waterfront park where you can watch the boats come into the marina or visit the Little Traverse History Museum. What can you do in the Petoskey area? How about visiting the Crooked Tree Arts Center, bike the Little Traverse Wheelway, take in a musical performance in Historic Bay View, or play outdoors. And that is just in the summer. Petoskey is a four-seasons community packed with things to do. From beautiful fall foliage, to morel mushrooms in the spring, to top notch skiing and snowboarding in the winter months, we have it all. Winter activities are truly spectacular in the Petoskey area. Come enjoy all that we have to see and do!